Thanks For The Dance . . .
October 6, 1956 was a clear, crisp, sunny day that I had been waiting anxiously for several weeks. I had been told that on that day, I would get to attend a college football game with my dad, Hoyt Buffington, uncle Ray Williamson and my cousin Tom Williamson. Tom had been an outstanding tackle for the Jefferson Dragons before his graduation from high school in 1953. He always bragged that it was his blocking that sprang Jefferson legend Don Cole for many of his touchdown runs for the Dragons during the 1952 - 53 seasons. Future Class of 1964 graduates in my class were guys like Buck Tolbert, Thomas Bond, John Davis. Jr., Terry Marlow, Gary Brooks and Terry Cotton. Some of my young lady classmates were Susan Ethridge, Posy Storey, Doris Sears, Ada Ellen Potter, Julia Stovall, Guy Dean Parks, Vicki Ray and Gloria Spence. Just a group of kids tied together by fate and happenstance as we all started to school together in 1952. The Georgia Bulldogs were playing the Mississippi State Maroons at 1:00 p.m. in Sanford Stadium that Saturday. I tried to picture in my mind just what a college football stadium would look like compared to Jefferson Memorial Stadium. I had seen video shots of Sanford Stadium as I watched the Georgia game replays on Sunday evenings after a Saturday game, but I had never been able to see the entire stadium. I never came close in my mind to realizing the vast difference in a college stadium and a high school stadium until I made my way into Sanford Stadium on that beautiful day in 1956. I don't know if there has ever been a bigger Georgia Bulldog fan than my dad. He and the Williamson's would attend many games over the years in Athens, while I never thought much about going to a game until I started attending the Jefferson Dragons games regularly in 1955. That's when my addiction to football began. I began my quest to attend a Georgia game after listening to the Georgia-Vanderbilt game on the radio in the Tom Williamson radio and television repair shop in Porterville as the Bulldogs played their first game of the season in Nashville. 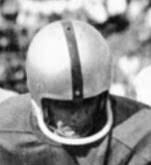 ( A future New York Giants halfback named Phil King led the 'Dores to a 14 - 0 win over the Bulldogs.) I had learned earlier that Tom and his dad had plans to attend the first Bulldog home game versus Florida State ( Georgia would win the game 3 - 0 on a late 43-yard field goal by Ken Cooper. ) the following week. So I started my campaigning for making the trip to the home game after that game. Little did I realize that the young man playing quarterback for the Bulldogs that day would wind up being a good friend of mine for many years during the early 70s through the mid-90s. Billy Hearn was the Bulldog quarterback that day. I well remember that number 10 along with other Bulldogs of the day like, halfback Carl Manning, fullback and Captain Knox Culpepper, Sr., flanker Jimmy Orr and kicker/end Ken Cooper. Hearn and I became friends as members of the Northeast Georgia Basketball Officials Association. We must have called over 200 games together over the 28 years I officiated high school basketball. He lived just outside Winder, on the Braselton highway. He would come through Jefferson, pick me up, and we would go to Hart County, Stephens County, Gainesville Jr. College and many other places all over Northeast Georgia to referee games on a Tuesday, Friday or Saturday night. Billy Hearn was probably the best official I ever called a game with in over 28 years of high school officiating. He took me on a tour of his Winder business, Southeastern Waistband, and I later reciprocated by taking him on a tour of my Gold Kist, Athens Poultry processing operation. Now it's been over 62 years since I became a Jefferson Dragon and Georgia Bulldog supporter. There's been highs . . . there's been lows. One thing I'm sure of is that I have never regretted becoming a high school and college football fan. To all the Dragon and Bulldog players over these many years . . . Thanks for the dance! A rare 1935 photo of he University Of Georgia football team. My Jefferson High School Coach John W. Davis is number 20 and Alf Anderson, who became the athletic director for Jefferson Mills in the late 40s and early 50s is pictured next to him ( Number 43). 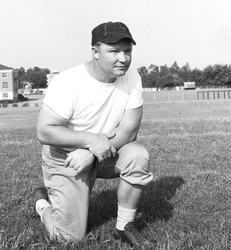 Coach Wally Butts was the Bulldog coach in 1956. 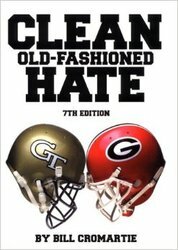 In 1956, the Bulldogs lost to Georgia Tech 35 - 0 in Athens. It was their 8th consecutive loss to the Yellow Jackets. The next year ( 1957 ) the Bulldogs, behind the running of Theron Sapp broke the drought with a 7 - 0 victory in Atlanta.